In their discussion of the new plans they talk about average monthly usage. That would be OK if they billed on average monthly usage. They don’t. Last week at&t announced a new tiered plan for pricing data to smartphones like my iPhone. All you can eat data plans are gone. Two news plans emerge at 200Mb and 2Gb per month. Both cost less than the old unlimited model. My plan is grandfathered in. Phew! First a note about some at&t hanky panky. In their discussion of the new plans they talk about average monthly usage. That would be OK if they billed on average monthly usage. They don’t. My monthly average usage has been under their new cap, but I still have two months above it! An at&t customer who fits in their new criteria might still have to pay overage charges even while averaging below the limit. Under their new plan I would. And, of course, unlike nearly everything else in this world the price per byte of data goes up as you use more under at&t’s new rate structure. “While AT&T asserts that its high-end 2 GB cap will only impact the heaviest users, the fact is that today’s heavy user is tomorrow’s average user. Internet overcharging schemes like the one AT&T proposes will discourage innovative new uses and stifle healthy growth in the mobile broadband economy. Devices like the iPhone or one of the killer Android phones or any still to-be-seen hardware are all still in the serendipitous stage. Much of what you get from them is a surprise until you actually get it! New methods and technologies are constantly being introduced. I didn’t buy my phone thinking it would be how I watch baseball or listen to NPR or guide my car, but it does all those things and more. I expect it to do even more in the future though I have no idea what that might be! Smartphones are transformational devices. We need to nurture their use, not stifle it. Unfortunately at&t’s plan does just that! AT&T is really shooting itself in the foot with this move. The solution to their overburdened network is to expand the network’s capabilities, not penalize their customers for actually using the services they offer. Their iPhone customers are used to unlimited data — that horse is so far out of the barn, there’s no getting it back in. Once you show the people what’s possible, you can’t suddenly take it away from them. Consumers may not even be aware what counts as “data” on a cellphone plan. Most would accept that watching streaming “TV” programming is. But how many realize that using the built-in GPS also counts against one’s allotment? (And that built in GPS is darned handy, as my wife and I learned recently on a trip to NJ where were forgot to pack the Garmin). The unanswered question is whether the other “Big 3” cellphone providers — Verizon, Sprint and T-Mobile — will follow the AT&T scheme or try to promote themselves as better value/unlimited usage alternatives. When is News8 going to get a Droid app? Hi Rob – This website is not associated with Channel 8. I hope you understand. 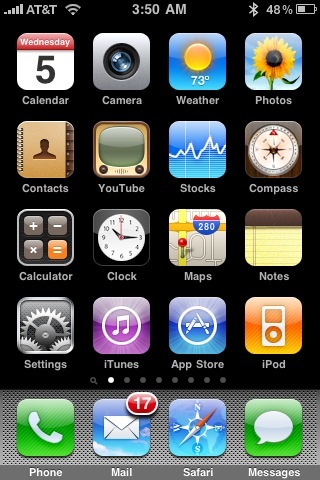 Geoff, I have noticed when you post a picture of your IPhone, it includes more than one icon on the bottom. One of the last updates removed all but Safari from the bottom of the screen on mine. Smitty – It is running 3.1.3. It is not totally ‘stock,’ but the icon schema is standard. So you may have screwed something up. There is a huge iPhone community who can help, but they’re currently salivating over the new phone. Smitty – It is running 3.1.3. It is not totally ‘stock,’ but the icon schema is standard. You very well may have screwed something up. There is a huge iPhone community who can help, but they’re currently salivating over the new phone.